Director Sarah Esdaile has reinvigorated a modern classic. 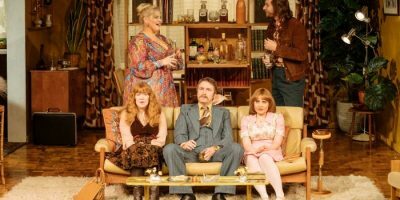 Why would anyone decide to stage a production of Abigail’s Party in 2019? Mike Leigh’s 1977 play of cringe-comedy and social faux pas remains so indelibly tied to both the setting of seventies Britain and the BBC broadcast production directed by Leigh himself and starring Alison Steadman as the domineering housewife, Beverly. In staging this production, Esdaile admits that she was faced with the challenge of not ‘reinventing the wheel for the sake of it,’ while also trying to present the play through a fresh lens. Fans of the original need not despair. 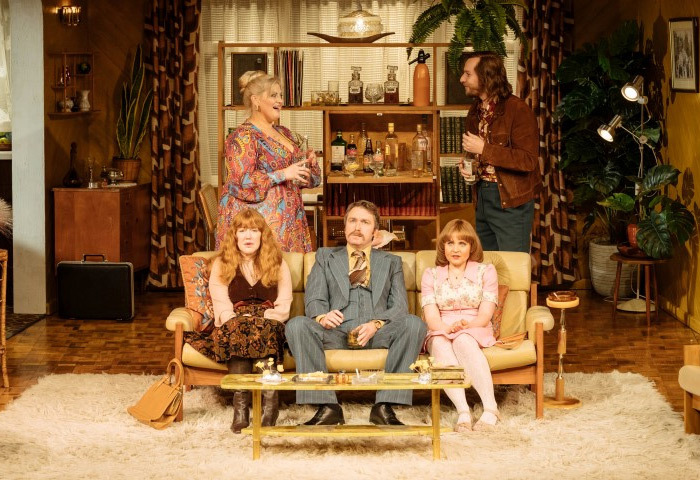 This production draws in the audience from the outset, with a fantastic set design including a moving housefront façade and note-perfect 1970’s décor. Leading lady Jodie Prenger chews the scenery in the best possible way, making the role of Beverly her own. But it’s not a performance that’s all style over substance, Beverly may be domineering but Prenger is a team player, and the whole cast has a chance to get a good mouthful. In terms of updating the 1970’s setting, there really wouldn’t have been any point. A modernised version of the play would have lostso much, and if anything the look back into the past only serves to enrich the material. While a few lines may play differently to a modern audience this always seems to work in the play’s favour. There might be a few more gasps at hearing the word ‘coloured’ than there were in the original staging, but this is nothing compared to hearing a character mention buying a house for twenty odd thousand pounds. Cringeful moments, class anxiety, domestic unrest, all themes that can play to a British audience in any era, but thankfully the play isn’t making some overt ‘look how little’s changed’ political statement. It would have been cheap and easy to slip in some quick reference to the European Union as a grasp towards relevancy, and any temptation to do so has been resisted. This is everything you’d want from a revival of a modern classic, a script that’s just as good as ever giving a cast of talented performers a chance to flex their dramatic muscles.